I grew up in a home where decorating daily was normal. My mom was always rearranging furniture and switching out accessories from room to room. I think she got that from her mother, because my grandmother is the same way--always fixing and fluffing, making sure everything looks pristine. Coming from two women who put even HGTV to shame, I've always had a love for decor. I may not be a professional at it and have a lot to learn, but I do love to play around with new pieces, different arrangements, and fun colors. 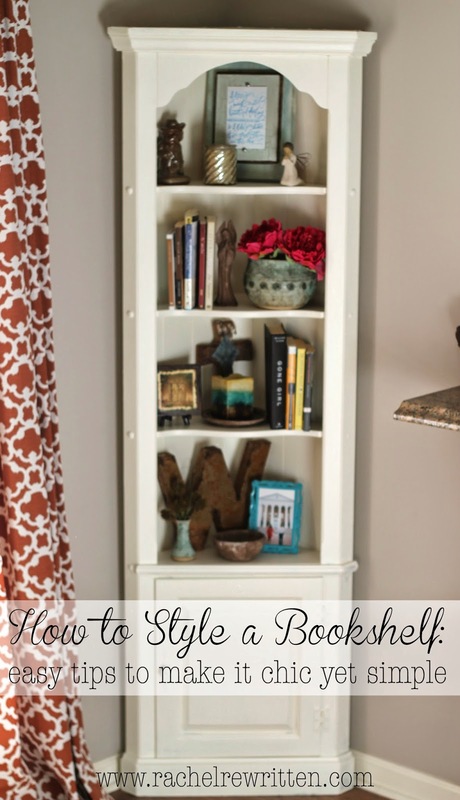 One of my favorite things to style are bookshelves. Of course, with any decor, it all depends on your taste and your preferences. There's no wrong or right way to do any of this; it's all about making it look like you want it to look. That's really the fun in it--taking a few suggestions and twisting it into a gorgeous product with your personal touch on it. You may love some aspects of my shelf, you may hate others. So grab your favorite pieces and get to styling; I guarantee you'll end up with something you love! 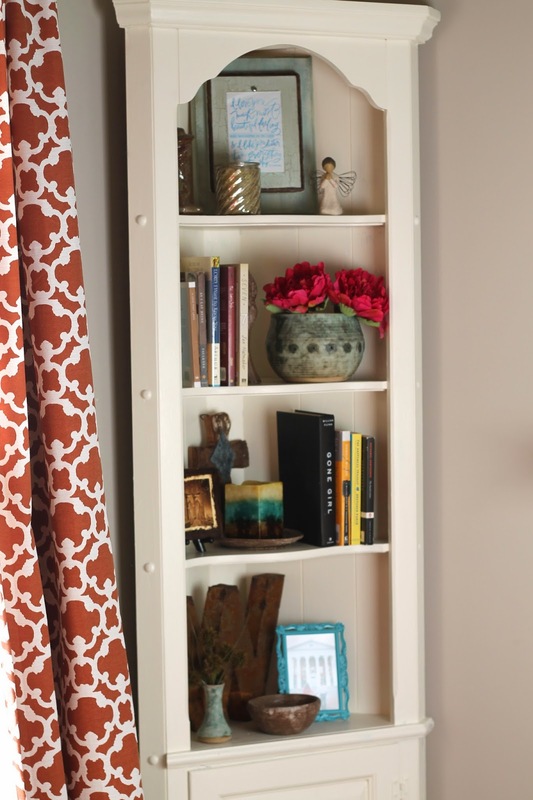 I'm no expert, but these are tips that help me construct a bookshelf style that I love! one. Clear your bookshelf. Take everything off and start with a blank slate. And grab a glass of wine while you're at it. Group together all the things you want to use, just so you get a clear picture of what you have to work with. two. Books are your friends! Use your favorite books as show-off pieces or grab bound books to stack as height under other pieces. Don't be afraid to go horizontal or vertical with them! They're great to take up space and make the space look more colorful. Vary their sizes, too. The same size book across a shelf is boring! three. Putting different textiles on the same shelf is always a yes. A metal object such as my "W" initial with a ceramic piece of pottery help create a fun contrast of materials. The juxtaposition of different organics together create a pretty picture. Add in a wooden cross or a feminine bloom to show a whimsical side of the person styling it. Even if a plant is fake, it adds a little pop of life to a shelf. four. Always place a personal touch on your shelves. Something like a photo of your family, a favorite place, or a loved quote make personal and unique to your home. Like I said earlier, the best part of styling is putting your own spin on things. five. Blank space is okay! My bookshelf is fairly narrow so there isn't much room, but if yours is wider, take advantage of negative space. I'm eager to get a bigger bookshelf one day to play around with. Don't be afraid to place something in the center of a shelf and leave the rest of it empty. six. Layer. Put things in front of one another, even if you think it "looks funny" right at first. It creates depth and adds interest. This is when all of your fun little knickknacks come into play--grab those fun things that intrigue you and inspire you. Anything from an antique teacup to a candle to a small canvas...your options are endless. Fill in spots that look like they're calling out for a little something. You'll be presently surprised when you just start placing items; it somehow all falls into place. seven. As with any good work of art, take a step back and walk away for a while. Sleep on it. Come back to your beautiful bookshelf the next day and take another look at it and see how you feel about it. Tweak it until you feel good about it, and then show off your styling!